Carte de la Peninsule Comprenant l'Espagne et la Portugal. 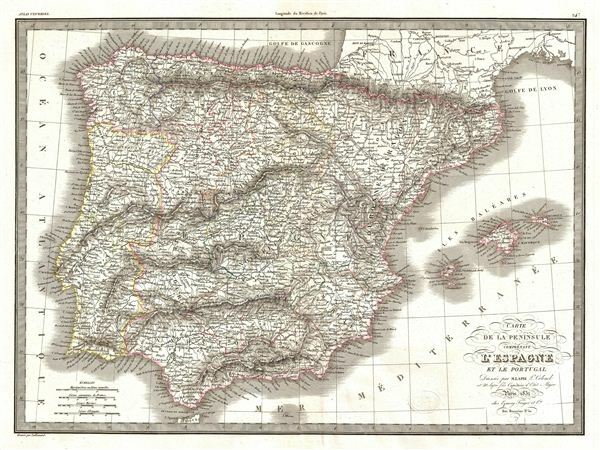 A fine first edition example of M. Lapie's 1831 map of the Iberia or Spain and Portugal. The map covers all of Spain and Portugal from France to the Mediterranean Sea and from the Atlantic to the Balearic Islands. During this period Portugal on the cusp of the War of the Two Brothers. In 1826, Peter IV of Portugal abdicated his thrown in favor of his seven year old daughter Maria da Gloria, on the condition that she marry her uncle (Peter's brother) Miguel. Miguel deposed Maria and proclaimed himself King, which led to the Liberal Wars, and eventually resulted in Miguel being forced to abdicate and go into exile, and Maria II being proclaimed Queen. During this same period, in Spain, the death of Ferdinand VII also saw his daughter, Isabella II, an infant at the time, proclaimed Queen. This would also lead to the First Carlist War in Spain from 1833-1839. This map was engraved by Armand Joseph Lallemand as plate no. 24 in the first edition of M. Lapie's important Atlas Universel. This map, like all maps from the Atlas Universel features an embossed stamp from the Lapie firm. Rumsey 2174.024. Phillips (Atlases) 754, 765.